The Affordable Care Act doesn’t work for everyone. 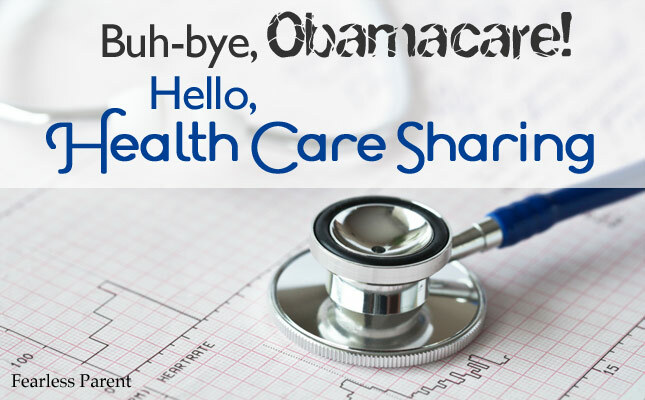 Here’s how to opt out of Obamacare and enroll an alternative solution. Since leaving our corporate jobs, my husband and I have spent an obscene amount of money on health insurance that never covers … anything. On the rare occasion that I go in-network, the appointment is usually a dud … punctuated by the scripts I won’t fill, the treatments I decline, and the follow-up appointments I won’t make. So when I took a look at what the Affordable Care Act says my family must now pay, I knew we were done. I had reached the point beyond which I will not be pushed. When it comes to health insurance, the Habakus family is sending a pink slip to government and industry. I’ve found a solution for my family that’s also a tangible rejection of the current system. If you have individual coverage, if you had a plan that was canceled thanks to Obamacare, if you’re young, and if you’re ineligible for subsidies, then you’re probably paying a lot more. To make matters worse, your doctor might be among the over 214,000 providers exiting the Obamacare exchanges — about 25% of all professionally active physicians. I’ve kept our insurance this long because, well, you know … someone might need a limb reattached. But I haven’t been applying critical thinking to this decision. The prospect of paying twice as much for less of what I want finally got my attention — along with the knowledge that the pharma-government-insurance complex will deliver more changes that I won’t like. And make no mistake — you are no longer in charge. It’s not always possible to say, “No, thanks.” The institutional response to disagreement about health care treatment has become increasingly Draconian. Imagine, God forbid, your child is very sick and the hospital is insisting on “lifesaving,” standard of care medical interventions that you are unwilling to pursue. The only person standing between you and a total nightmare is your physician. Now let’s assume you chose the doctor because she takes your insurance. Will you be surprised to learn that she’s not on your side? If the hospital won’t discharge your child, you can’t leave. It happens all the time. It happened to me. Once Child Protective Services is called, you’re in big trouble. Legal medical kidnapping is a growing problem. (Tune into Fearless Parent Radio™ on December 17). I will no longer participate in a system that incentivizes me to use health care I do not want. I will no longer subsidize health care that conflicts so fundamentally with my values and beliefs. I will no longer support a hidebound industry with zero innovation, bad customer service, and obscenely high executive compensation. I no longer feel safe with traditional health insurance coverage. The dynamic has become adversarial. I want more control. I refuse to pay one more dime into a dysfunctional, overpriced, abusive, unethical, damaging, and totally broken system for insurance coverage that I stand on my head to avoid at all costs. Big words, but now what? You have to pay a penalty unless you’re exempt. Alternative plans include critical illness insurance, supplemental accident and sickness coverage, and fixed benefit plans. There are strategies for self-pay patients to lower their bills. Health care sharing ministries are growing rapidly. Huh? What’s a Health Care Sharing Ministry? It is a cost sharing arrangement for medical expenses among people who hold similar religious beliefs. It is not insurance; no one assumes responsibility for your medical bills. It is exempt from Obamacare. There are four “grandfathered” options. Three are open to practicing Christians and one is for people committed to religious liberty. Individuals and families pay a monthly share. Payments are made to members with approved medical bills. Members adhere to certain lifestyle guidelines, including abstention from tobacco and illegal drugs, and sign a statement of faith or belief. Certain expenses may be excluded (i.e., those associated with pre-existing conditions, preventive care, vaccinations, dental, vision, birth control, abortions, STDs, and infertility). Samaritan Ministries International is an Illinois-based not-for-profit corporation that started sharing medical needs in 1994. As of November 2014, there are 39,000 participating households with 129,500 members (up 62% in the past year). First, it’s well run. Here’s their 2012 Form 990. We spoke with current members who rave about it. I couldn’t find any online complaints. When I asked our agent for dirt on Samaritan, he mustered a feeble defense for insurance. He admitted that he’s losing customers to it: “It really works.” I love that Samaritan contracts with The Karis Group to negotiate discounts — typically 40-45% — on our behalf. Second, it works for my family. We agree with Samaritan’s philosophy of health care and its member requirements, including regular church attendance. Third, Samaritan’s guidelines offer more control over our health care choices. Its rules are the simplest. Members select their own doctors and hospitals, and can travel out of state for procedures. It includes visits to licensed alternative practitioners, including naturopaths. Alternative treatments and “prescriptions” are subject to an additional approval process except for cancer treatment which can be 100% alternative up to the $250,000 maximum. Samaritan is evaluating the equivalency of alternative medicine in more areas. Finally, instead of paying Blue Cross, I’d rather be part of a community that sends checks to real people to help lift financial burdens during their time of medical need. Samaritan is definitely not for everyone, however. Read its FAQs and Guidelines, or call 888-268-4377 #2. Here’s what I wanted to know. Young adults aged 25 and under pay less. There is a one-time $200 membership fee. Members identify themselves as self-pay patients when they go to the doctor or hospital. Most providers are cash-friendly and many like avoiding insurance hassles. Sometimes cash-pay prices are lower than insurance rates. Members are eligible to receive up to $250,000 in medical bills per qualifying event, after paying the first $300. Discounts are applied to the $300 first. Members are not terminated for having too many medical events. When members submit medical bills, they are added to the prayer list so everyone can begin praying. After verification, Samaritan publishes qualifying needs in the monthly newsletter and then they are assigned. Each member is asked to send the full amount of his monthly share amount to a single member with an approved need, along with notes of encouragement. Checks from members are considered gifts, but Samaritan ensures that amounts do not exceed the IRS annual gift exclusion (currently $14,000). Missouri amended its income tax code to allow a full personal deduction of health care sharing ministry expenses. The deductibility in other states is unclear and not recommended. This is a useful article from the Journal of Accountancy about the tax implications of religious exemptions from the health care individual mandate. Applicants should discuss concerns with their tax advisors. The optional “Save to Share” program addresses catastrophic medical expenses. Beyond the main points listed above, this is what clinched it for my husband. Up to one-half of available “Save to Share” funds — currently about $5.5 million — can be shared for any single qualifying need above $250,000. No payment is made unless there is a qualifying need. The largest need during Samaritan’s 20-year history was $1.5 million; it was reduced to $750,000 through negotiations. No one in “Save to Share” has ever been cut off due to insufficient funds. AND PRE-EXISTING CONDITIONS, LIKE AUTISM? Samaritan will publish medically-necessary treatment for qualifying injury or disease ordered by a licensed practitioner. If any member, including a child with autism, has an eligible medical need, such as a concussion following an accident, the expense can be shared in the same way that the ER visit of a hemophiliac would be shared after sustaining a cut. The cause of the ER visit is the cut not the hemophilia. Ditto for a broken bone due to a fall for someone with osteoporosis. Autism as defined in the DSM isn’t treatable, but medical conditions in autism are. So there’s no sharing for ABA, social skills, or communication deficits, but yes to colitis or Lyme disease. Detox and supplements must directly relate to the eligible medical or injury diagnosis and prescribed by the provider. Hyperbaric, physical, occupational, speech, vision, and analogous therapies related to injury or disease are publishable. A condition is no longer pre-existing when a member has been symptom- and med-free for 12 months. Cancer is 7 years for that particular type of cancer. Type 1 diabetes and heart disease are always pre-existing. Prescription expenses for the first 120 days are shared. ADHD meds are excluded. Providers may be asked to complete a verification form regarding pre-existing conditions. If you’re not in “Save to Share” and your medical expenses exceed $250,000, or you have a pre-existing condition, the Special Prayer Needs ministry may be able to help. Members share on a free will offering basis. Recent medical bills for a little boy with cancer totaled $300,000; members voluntarily contributed the balance. This is based upon the extra generosity of members and cannot be relied upon. If someone on your list stops sharing, his amount will be reassigned the following month. If there are more medical needs than shares, Samaritan will use a prorating method. For example, if there’s enough for 90% of publishable needs in a given month, then 90% of each need will be published for that month. If prorating occurs three months in a row, Samaritan’s Board will propose a share increase. Applicants can begin membership the day they sign up online. The first month’s share is paid by credit card and the completed application, including the pastor’s signature, is due within 10 days. Medical needs cannot be published until the form is submitted. Categories: Opinion | Tags: affordable health care act, health care, health care act, health care insurance, obamacare | Permalink.